GSA has declared 2018-2019 “The Year of the On-Ramp” for the OASIS Small Business Contract Vehicle. On-ramps have occurred, or are occurring, in pools 1, 3, 4, and the new 8(a) pool of OASIS. 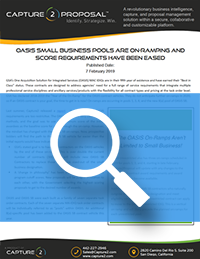 While the requirements to get into the OASIS contracts have always been stiff, these new on-ramps offer an excellent opportunity for small businesses.